Welcome to the Blood Bound tour! Today The Cover Contessa welcome Keshia to tell us a little about why mommy writes! I can’t tell you the number of times I’ve been asked recently to describe my “writing process.” People want to know what my writing schedule is like, where my favorite place to write is, and what, if any, playlist I use to get the creative juices flowing. The truth is that I had an “office” at one point. A small desk wedged in next to my clothes dryer. Then during a home improvement project (my husband swears he has no idea how this happened) my $5 desk chair was left outside in the rain and my desk became a tool bench. So now, my “writing spot” is my dining room table, the couch, the bed, or anywhere else I can sit for a few minutes. I say “a few minutes” because that’s usually all I get. There is no such thing as a schedule in my house. I work during naptime (after trying to clean the house a bit) and on the rare occasion that a toy or movie is holding my son’s attention. Which brings me to my playlist. It’s VeggieTales. Or Disney movies. Or gentle snoring on a baby monitor. I know my “work schedule” sounds less than ideal. Actually, it sounds like chaos. And it is. But it’s my chaos, and I love it. You see, writing has always been my dream. That thing I wanted to try “one day.” Then it hit me. Today is one day. There will always be reasons to wait on dreams. Wait until “things get settled,” or “when life isn’t so busy.” But that’s not really the way life works. Something else always seems to come up. Your dream may not be to write. But I bet you have something you’d like to try. And I bet there are a million reasons to wait and try it “one day.” But I’ll give you a reason to start today: Because you want to. Don't forget to download "Family Ties" the story that inspired my book. And, if you have time, visit me on Facebook, Twitter, or my blog, The Book Addict. Thanks so much for stopping by today Keshia! It was great to have you here. I've come to the conclusion that reality is no fun. I still check in every now and then to pay the bills and change diapers, but I spend most of my free time reading, talking about what I've read, searching for something new to read, or writing about my own fantasy world. And now, let's see what I thought of the book! I want to thank Spencer Hill Press for sending me a copy of this book to read and give an honest review. Receiving this book for free has in no way influenced my opinion or review. First, I must say that I love that the cover of my ARC is different from the actual cover of the finished book. Once you read the book, the cover for the ARC makes complete and total sense. I'm excited to have a copy of it! And the colors are so beautiful. They are very similar to the finished cover, but there is less going on! I want to say that I love Brielle. At first, I found her kind of annoying, being all swoony over Alex and acting like a typical teenage girl. But throughout the book she really grew, and grew on me, and totally came into her own. It was great watching her form a better opinion of herself and also watching her realize she is so much more powerful than anyone could think. Dr. Schwartz comes off as the villain when you first start reading about her. But in the long run she ends up being someone you never thought she was. And it will certainly surprise you and make you understand better her relationship with Brielle. And Pamie, I love Pamie! She's quirky and fun. And you can tell she really cares about Brielle from the very start. They click and the relationship just seems right. Alex, well, I didn't get much from him, to be honest. I was kind of happy that he didn't turn out to be the center of Brielle's world, that she had other bigger things to worry about. And, while it's nice to see some romance, I was glad it didn't overtake the book. I like the plot line of the story. It's nice to watch the halfies, full and Unseelie interact. I have read very few Fae books, so it always interests me to see what kind of spin an author will take on this folklore. Swaim really pulls you along in the story, making you want to know exactly what the fight is between the Unseelie and the Fae. I also love how Keshia gives her characters different powers. It's fun to watch them all interact and use those powers on each other and also on their foe. And her writing really is quite great. It actually reminds me a lot of Jennifer L Armentrout and Brielle reminded me a bit of Alex from the Covenant series (my most favorite series of all time). So kudos to Keshia for getting the voice right and making me want to keep reading! I can't wait to read more from Swaim. I can only imagine her writing will get better and better! 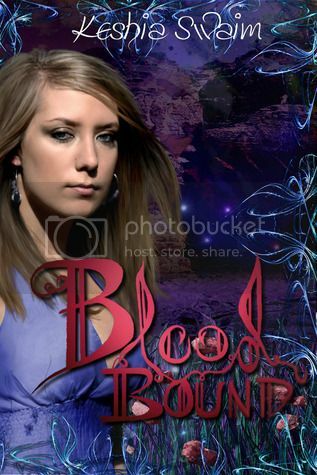 Click on the link below and enter to win a signed copy of Blood Bound and swag pack!